Spring is giving way to warmer summerish days. The fields that were lush green just a couple of weeks ago have started trading sun-kissed golden yellow color for their vibrant green. In my attempt to hold on to spring just a little longer I set out looking for signs that spring is still here.That there is still a chance for a fresh and new beginning even when it seems it might be too late. A sign that even when it seems everyone is well on their way to their summer, you can still start, fresh, vibrant and hopeful. I love watching her bloom every year, at her own timing, love watching those shiny new and hopeful leaves unfold and reach for the sky.You see, sometimes life feels like a mad race, there is so much competition, so much that you must do, need to do, are expected to do. It is so easy to feel overwhelmed, to feel like it is too late and you’ll never catch up. 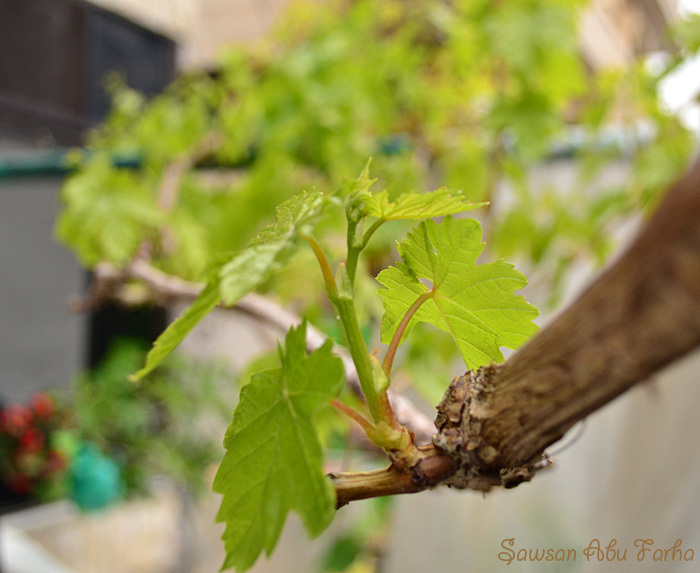 My little vine friend reminds me, year after year that life is a journey not a race and even if you are a late bloomer, don’t worry about how far ahead people are or what they may think of you. Just unfold your leaves and reach for the sun, give it your all and enjoy it. Speaking of beginnings, my favorite way to start the day is with a bowl of granola and some milk or yogurt. Homemade granola is really easy to make, tastes a lot better than anything you can buy, it is much cheaper that anything you can buy and the best part is, you can make it your own way. You can add the nuts, dried fruits and spices you like and mix and match till you find the perfect blend. I like adding puree dates to mine to increase the nutritional value and add another layer of flavor and some sweetness. Apple sauce serves the same purposes, together the apple sauce and the dates help the granola form chunky clumps which I love snaking on. Mix your dry ingredients, oats, brown sugar, flax seeds(if using), cinnamon, cardamom and nuts (if using). Mix the apple sauce, date puree, syrup, orange juice and oil. Pour the water over the dates and stir, set aside and stir every 10 minutes till it cools down then pulse in the blender or food processor. I like my granola really crisp so what I do is bake it for 1 hour (stirring every 15 minutes) and then turn off the oven and leave it in the oven till it cools completely. If you decide to use pistachios add them after the first half hour, if you add them from the beginning they will burn. 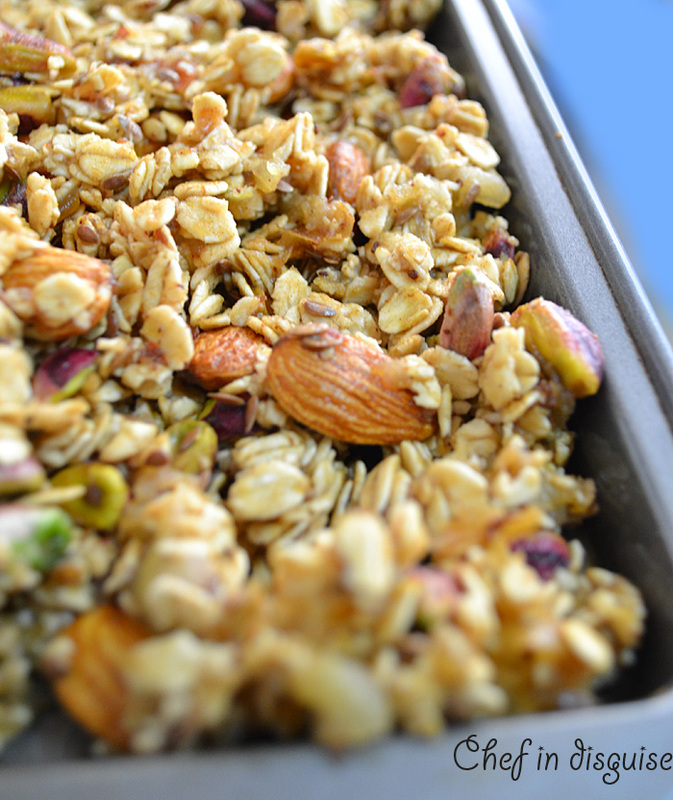 Posted in Breakfast and tagged almonds, Granola, home made, pistachio, recipe, rolled oats. Bookmark the permalink. This granola looks insane – why in the world would you want to buy granola if this is available? Yum!!! Your granola is quite beautiful, Sawsan. I have never heard of making it with fruit puree. Lately I have been making mine with walnut oil and maple syrup. I’ve never made homemade granola, but have tasted it and I agree, soo much better than store-bought! Yours sounds fantastic, and I’m sure is delicious with some yogurt. Love your parents’ garden. I wish I had my own! That is some really beautiful looking granola and the taste must just be amazing with all the great ingredients. I particularly love the idea of the date syrup…inspired and I can imagine what kind of rich flavor it adds. I love this one.. Sometimes even blogging can become a “competition”of sorts.I have and never will have any intention of going down that road.. I am happy being my own little vine..:) I love your granola.. Especially when you add the purée and it can turn into snarky little clumps.. I love that!! My friend Barb at Profiteroles and Ponytails makes her own granola! I’ve never made it, which is too bad because it’s one of my flavourite breakfast foods. I’ll bookmark this recipe for sure! Thanks Sawsan. My gosh your homemade granola looks fantastic. I’m loving your healthy snack…looks like I can get quite addicted to this! Hi Sawsan, I love home-made granola. I never buy it these days, not since I discovered how darn easy it is to cook. I never bake any fruit or nuts though – I always add them in at the end because I don’t like them to be tough or chewy. Yours looks marvelous – just bursting with delicious flavours! Thank you so much Tanja, I try to add dates to desserts to increase the nutritional value especially for the kids. I think they add more than just nutrition, the rich flavor of dates and their sweetness really take this to the next level. I really like the touch of adding the applesauce/ date puree. Great recipe – I am printing this one out! Life is indeed a journey and not a race…and I´m not very competitive so am quite happy plodding along and watching the world go by as I travel along various paths! I´m not a huge cereal eater, but when I do, this is the one I go for. Perhaps if I made your truly wonderful granola, I´d be more motivated to get up and go in the morning knowing that a bowl of this delicious granola was waiting for me.Love the dates and apple purée…very luxurious and gorgeous. Granola has been on my list for months now – I need to do this!! Yours looks like the perfect morning pick me up! Okay i am trusting you. I am making this tomorrow as I need to go to the store to get some ingredients. I have been trying granola recipes literally for the past 3 weeks to find the one I love and still haven’t found it! I am counting on you:) No pressure or anything! LOL! I feel like I am back in school and I have an exam! I hope my recipe passes the test. What a colorful and wholesome granola! I love all the variations of nuts you used. Great recipe, Sawsan! You’re right! If I had this in my pantry there would be no reason to ever buy granola! 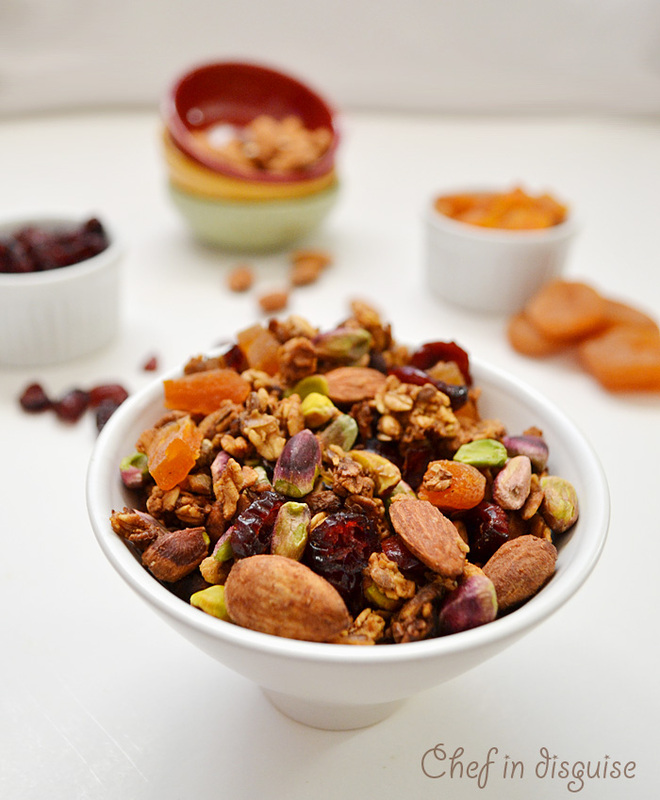 What a delicious granola and so hearty and flavorful! This is a really unique recipe! I like all of the flavors. I have made “traditional” granola- which you make look bland, lol! 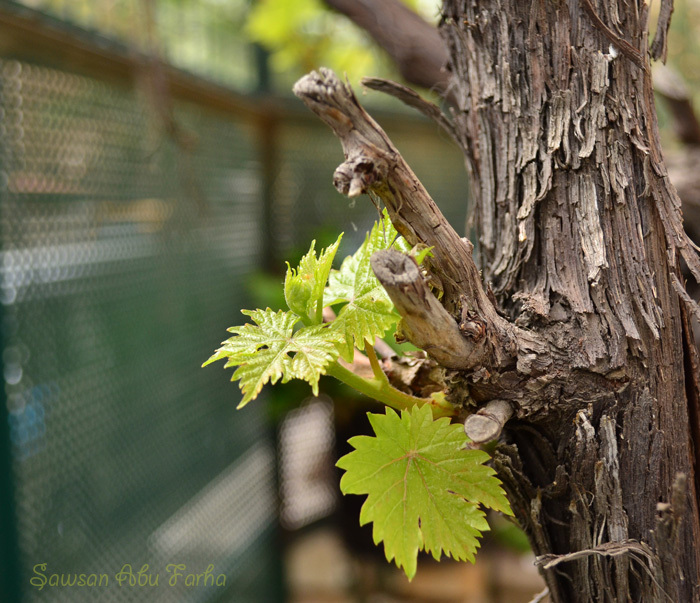 I know what you mean about that one vine or tree that staggers behind the rest, but I LOVE that vine or tree because it not only celebrates the ‘late bloomer’ as you mentioned, but it also prolongs a very short season, Spring. Spring to me is rebirth, a look back and renewal. Shed those ugly winter boots and coats that drag you down (well, I do love my winter coat so I’ll just put it away carefully) and bring on the shorts and T’s that make you want to be outside! We’re ready for mojitos on the back deck and dangling our feet in the lake. I have never made my own granola, but do love a good old fashioned crunchy variety much like you have put together in this wonderful recipe. My friend Barb (Profiteroles and Ponytails) makes her own granola for her girls and has often exclaimed how easy it is to make. My sister-in-law buys a ridiculously expensive ‘designer’ granola when we go to the cottage in the fall, I think it may be time I made a little house warming gift of home made granola for them this year! I’m going to keep my eyes open all summer for a great vessel to put the home made granola in. Thanks for the inspiration Sawsan. I’ve never seen date puree used in granola. How original and interesting. Sounds delicious. The applesauce and dates. It is true I will never have to buy granola mix again. I love your description of the leaves unfurling. I think I am one of the slow ones in life, never rushing and rather enjoy it. We have one tree in our orchard that is always the last to bloom. While the others are sometimes in danger of frost, the late bloomer is always safe. Your granola must be so delicious. I love the color that the pistachios add. Your homemade granola and my frozen yogurt are going to be best friends. 🙂 Thanks for a great recipe. Oh I see my comment but it says awaiting for moderation. I just came here to see if any new recipe is up. 🙂 Will be back! 🙂 Have a wonderful weekend! I seriously need to make my own granola, yours look delicious!!! Every now and then I often dream of making my own granola bars and then I get lazy. Yours looks seriously more delicious than those store bought ones. I have been making my own granola for a few years now, but I consistently make th same one, a savory granola. I love you’re version. I definitely love a crispy variety so this sounds perfect. Have a great day! Thank you Kara for stopping by, a savory granola sounds interesting. Looking forward to checking out your recipe. I’ve been making my own granola for about a year now and this recipe sounds awesome! I am definitely making this weekend….I’m sure my husband & kids will love. Thanks! I made your Home Made Granola recipe this weekend with one slight modification….I added a small amount of coconut oil. It turned out better than I had imagined it would, even better, my husband loved it. This will be a “staple” in my pantry for sure!! I’m looking forward to trying some of your other recipes….hmmm, which one shall I try next? How do you store it? Does it need to be refrigerated or just in an air tight container? Does anyone have an estimate of calories?